Here's a free Scrabble Dictionary word checker. Just type in the word you want to check against the Official Scrabble Dictionary, and click the Check button. Type your word directly in the widget above. Then click the CHECK button. According to the Collins Dictionary website, this widget is "The only online Scrabble checker to use the official tournament word list. The official word list includes over a quarter of a million permissible words, and is endorsed by Mattel and the World English-Language Scrabble® Players' Association." Use this free Scrabble Dictionary word checker to determine which words are allowed or disallowed in Scrabble games. You can also view the definition of the word from the Collins Official Scrabble Dictionary. This word checker also displays how many Scrabble points the word is worth. This free Scrabble Dictionary even suggests other allowed words that use the same letters. CHECKING ALLOWED/NOT ALLOWED. To check whether a word is allowed, enter the word in the "Click here..." box, then click the CHECK button. A message about the word's status then displays above the word. If the word exists in the Official Scrabble Tournament Dictionary, a green "Allowed" message displays above the word. If the word is not in the dictionary, a red Not Allowed message appears. DEFINITIONS. For allowed words, you can view the dictionary definition including the part of speech and the meaning. Click the Definition button above the word to see this. SCRABBLE POINT VALUE. For allowed words, you can view the minimum point value for the word. This point total represents the sum of the tile points without modifiers like Double Word Score, Triple Letter Score, etc. The point value displays to the right of the Allowed indicator. COLLINS ALSO SUGGESTS. For allowed words, the online Scrabble dictionary widget displays other words that can be formed from the same letters. Who knows, you might be able to use your letters elsewhere on the board for even more points! To see the definition of a suggested word, click the word, then click the Definition button. 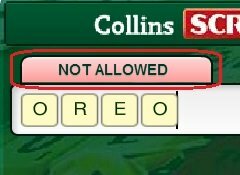 As you can see in the image at left, I checked whether "Oreo" is in the Official Scrabble Dictionary. Apparently it isn't, because the Not Allowed message appeared above the word. The Scrabble dictionary word checker has indicated this word can't be played in official Scrabble games. To clear a word, press the Backspace key or press the CTRL+D hot key combination. This free Scrabble word checker uses the Scrabble Pocket Dictionary and the Official Scrabble Dictionary as its sources. So its rulings are quite official enough for game play. "Settle all your arguments and check eligible words, with this new family edition of the Collins Scrabble Dictionary. The perfect reference for playing with family and friends, it includes short definitions." This Scrabble checker also works great during Scrabble practice. You can practice your Scrabble word-making skills by playing the free Scrabble Sprint online game on my site. By the way, I've expanded the size of the widget by about 40% from the original. This should make this online free Scrabble Dictionary word checker even easier to use. Many thanks to Collins for making this Scrabble word checker available. Online Scrabble Dictionary widget distributed by CollinsDictionary.com. Used with Permission.